Problems with shoplifters, retail security, loss prevention and inventory shrinkage? Now smaller retailers can have a security system like the big department stores. Easy to change poster like signage can be custom made for this sign at any Staples store. Make your own "specials" or "sale" signs to decorate the system and advertise your store. Get paid by name brand vendors to put their ads here as well. This way your system will pay for itself in more than one way. Available in 8.2 MHz, 4.6 MHz, 3.25MHz, 2.0 MHz, 1.8 MHz. 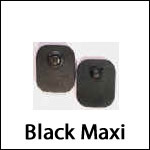 This tag is used as an alternative to the mini tag when a larger tag is desirable. Generally there is better reception of this tag on wide entrances (double door entrances). Size is approximately 2 1/4" x 2 3/4". Case pack is 1000 tags. These are used with a flat-headed pin. 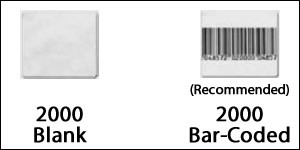 These radio frequency (RF) disposable Checkpoint® labels are available in plain white or with a simulated bar code. Please specify blank or simulated bar coded when ordering. Size is approximately :11/2" x 1 1/2". 2000 labels to a sleeve. This electronic pad must be connected to a standard electrical outlet at each cash register station. Various styles are available. 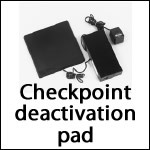 It is used to deactivate checkpoint 8.2mhz disposable paper labels securing boxed products. Size of pad that goes on the counter top is approximately 1' x 1'.